So you’ve decided to try Online Christian Dating? Great! Now let’s talk about safety dating tips to keep you from ending up in some whacko’s trunk! The Bible says it’s a wise and safe thing to have many counselors. So seek out several respected Christian friends and family members who would be willing to offer safety dating tip advice and accountability. These folks should be seen as a dating safety resource only, not as people you let run your life. While all dating decisions should be yours, hearing other opposing views can help you come to a right and godly dating decision. Don’t be in a such a rush to meet your potential soulmate in person. Take it slow. If the Lord is really leading you in this relationship, there will be plenty of time together. Instead, use your online Skype or e-mail experiences as a great way to get to know each other better. Ask questions about the other party’s beliefs, interests, jobs and family, always being on guard for inconsistencies. One of my good friends who recently got engaged after initally meeting through eHarmony waited over six months before meeting his date in person. By that time, the two had already built great emotional and spiritual communication bridges. Never publish or give out your real full name, address, home telephone number or private e-mail address to someone you just met online. This precaution will go a long way toward precluding any potetial harrassment or stalking. Quite a few Christian dating Services like Christian Cafe, for example, provide private in house e-mail accounts. If the partiuclar Christian matchmaker site doesn’t, simply create a free account with Yahoo or Hotmail and use a nickname or first name only. Are we being overly cautious with this safety dating tip? Yeah. But your safety and that of your family’s (especially if you are a single parent dating) is more than worth it. Yes, you can be loving and wise simultaneously. When you do decide to meet your Christian Date, make sure the location is a public place you know is safe. And while you’re at it, consider bringing along a trusted Christian guy or Christian girlfriend to assess the dating safety situation. Yeah, I know this dating tip could dampen the excitement of the initial meeting. But you could also pre-arrange a plan to have your friend split when things appear kosher. If your date has “a problem” with this arrangement, it should send up a red flag to you. An alternative to the above dating tip is to arrange for a friend to call your cell phone 20 or 30 minutes into your date. If things are going well, great! If your senses tell you this date is not safe to continue, you could use the phone call to cut short the night. While we’re on the subject of cell phones, you may want to consider purchasing a Global Positioning System (GPS) cell phone, that will be able to track your location wherever you go. Seek the Lord for discernment and leading. This is wisest safety dating tip of all, even though it is the simplest. Pray for wisdom and guidance, and Jesus will direct you. (Proverbs 3:5+6, James 1:5). If at any time during the dating process you feel uncomfortable deep down in your heart, this could be the Holy Spirit prompting you to move one. Don’t feel embarrassed or worried what the other person may think. Your safety must come first, since no one else can take care of that. 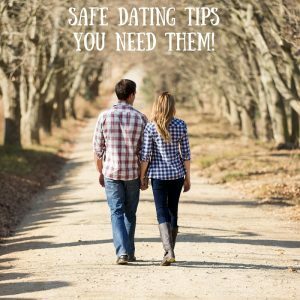 Do you have safety dating tips to share? Help other singles by sharing them on our site. In future articles we will be addressing more dating tips for Christian guys and girls. Am so grateful for this kind of dating advice, especially for me who lives in Africa .for i feel this is the easiest way of communicating. Am also greatful that through this kind of informations single get to learn more about Christ and also get to know what is expected out of a single Christian having self control over their bodies cause they are God’s vessels .i will continue to send top you my opinions about how a single Christian single should behave . My request is that is it possible for you to avail me the contacts of some of the single people looking for dates in Africa cause am seriously looking for a serious date .please if you can do me that favor .